Remington 870 DM Shotgun Arrives! You are here: Home / Firearms / Remington 870 DM Shotgun Arrives! Remington Arms has recently announced the new Model 870 DM shotgun. 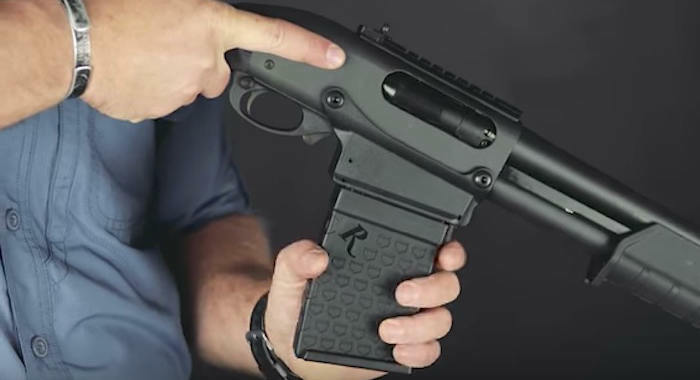 The new 870 DM is remarkably different from previous 870 models, with the DM standing for “Detachable Magazine.” That’s right, Remington is now offering a Model 870 shotgun with an externally detachable box magazine as its primary ammunition feeding source. The Remington 870 has enjoyed being one of the most iconic shotguns in American history, and continues to enjoy success today even 67 years after it was first released in 1950. With over 5 million Model 870’s sold, it appears Remington will continue to have a winning shotgun. The detachable box magazine may not be necessary for all shooters, but the opportunities it opens should present a very interesting market response. The new Remington Model 870 DM shotgun features Remington’s first detachable magazine fed shotgun. Shotguns with detachable magazines are not new to the industry, but I would say they are still somewhat on the fringe of shotgun shooters. Traditionally, shotguns have been most popular in pump-action (like the original Model 870), semi-automatic, or single and double-shot breech-open varieties. Current detachable box magazine shotguns are more along the AR-platform design, such as the Standard Manufacturing SKO-12, FosTech Origin-12, Akdal MKA-1919, or Panther Arms AR-12. 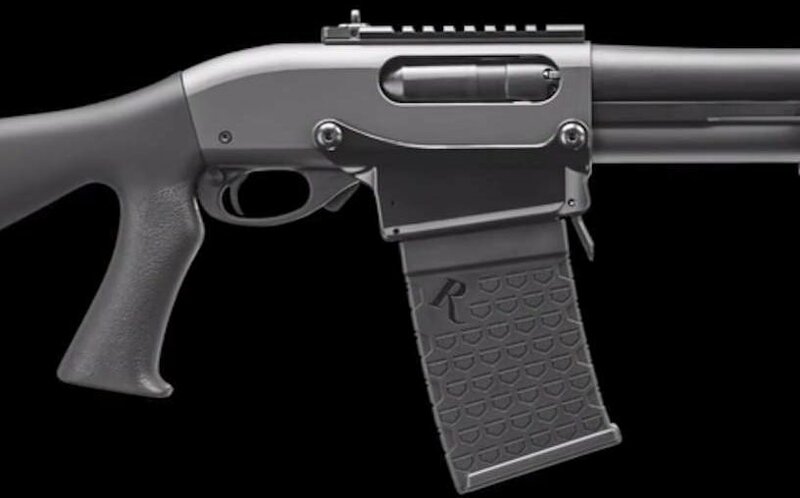 Though the 870 DM appears as if the shooter could transition to a standard Model 870 by removing the bolted magazine well, this is a stand-alone version of the 870 shotgun. The Model 870 DM looks very much like any other Model 870, including the original magazine tube, but is specifically designed to work with the detachable magazines. Chambered for 3″ 12-gauge shotgun shells, the Model 870 DM will present a powerful firearm option in a variety of uses, and will accept 2.75″ shells as well. The 870 DM will be fitted with a respectable 18.5″ cylinder bore barrel, and uses the standard 870 single bead sight. Though initially outfitted with a synthetic version of the original “corn cob” fore grip, the addition of a Magpul MOE M-LOK® fore-end would quickly expand both tactical and home defense capability. The Model 870 DM takes a fairly standard 870 shotgun and incorporates a magazine well located at the standard feed ramp area, with a detachable magazine. The immediate benefit of this design is shooter familiarity. Though the AR-15 style rifles have been hugely popular in the last decade, there are many more shotgun shooters. Most shotgunners have at least been exposed to a Remington 870. Since the controls and action are the same, the ability to transition to using the 870 DM should be fairly quick. Additionally, having a detachable box magazine provides shooters in the military, law enforcement, competitions, or home defense scenarios a much greater firepower option over standard shotguns. Even shotguns with extended magazine tubes (some as much as 8-rounds), lack the ability to reload quickly. The new 870 DM will have the option of 3-round and 6-round magazines, with one additional in the chamber, allowing the 870 DM to be fully reloaded in literally seconds. The magazine well is flared to assist the shooter in loading the magazine. Once loaded the 870 DM has the standard pump-action feeding as the original Model 870. Instead of rounds being fed from the feed ramp (accepting shells from the magazine tube), the rounds are fed into the chamber from the magazine. Notice the magazine release lever pressed back by the shooter’s left fore finger (photo from YouTube). 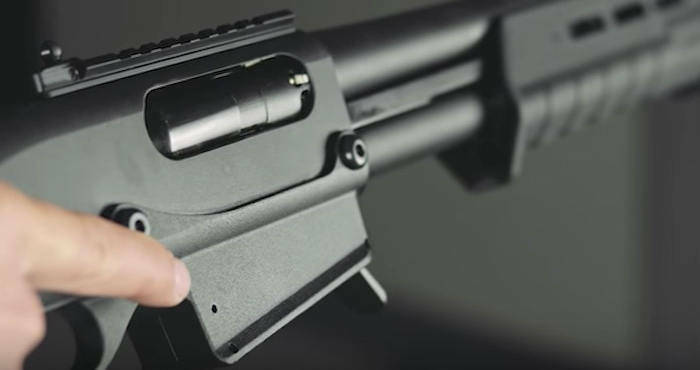 Upon magazine release the Model 700-like magazine release lever slides forward (photo from YouTube). Unloading the Remington 870 DM will be very familiar to Remington shooters. The magazine release is a pull lever located in front of the magazine well, just like Remington’s venerable Model 700 rifles with detachable magazines. The magazine release lever is at the front of the magazine well (Tactical version has Magpul furniture). Optional 3-round and 6-round detachable magazines. The Remington 870 DM Tactical comes with Remington’s Police pistol-grip stock. Rem-Choke threaded barrel with extended ported tactical choke tube. This new Remington 870 model has several legitimate options for shotgun shooters. From the basic target shooter, to the most dynamic self-defense situations, there are plenty of reasons why the new 870 DM could be a great selection. Target shooters have the benefit of additional rounds and faster reloads to keep the fun going. Those choosing a shotgun for home defense not only have the potential for more rounds, but more confidence in reloads should that be necessary. Police have a long history with the Model 870, and this version maintains the same key action and safety features. Transition training to learn to reload from detachable magazines rather than single shells to a tube magazine should be rather easy. Detachable magazines are particularly good considering fine motor skills fade fast in high-stress situations like a shooting or deadly force encounter. Box magazines should be much easier to handle and successfully reload. These detachable magazines also provide up to (2) additional rounds from traditional 870’s. This type of shotgun can also be a great option for tactical teams, where properly labelled magazines can hold a variety of specialty rounds (slug, breaching, etc.). In addition, agencies currently using Model 870’s should not have to retrofit patrol car shotgun mounts. Finally, the advance of competition shooting provides the Remington 870 DM with another great potential for shooters. The need and ability to reload quickly is known to be one of the best methods to reduce overall times during a competition. 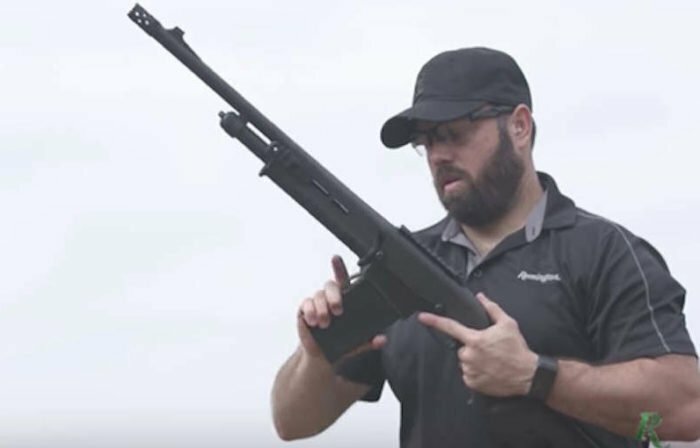 The 870 DM offers incredibly quick reloading, without the use of specialty loaders or the hope that your fingers will be true to form under stress. There will also be a wood stock/forend option, and a turkey hunting option as well. 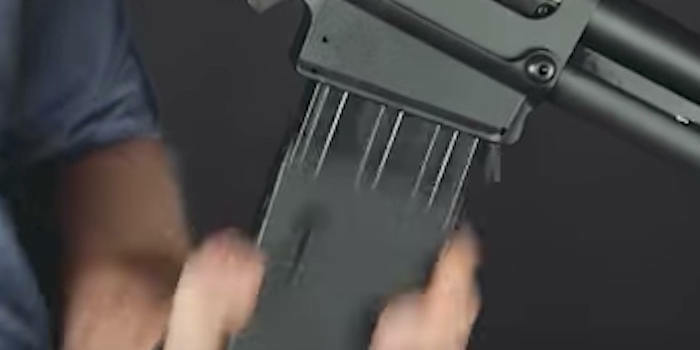 Reloading from detachable magazines is much faster than standard tube magazines (photo from YouTube). The new Remington Model 870 DM is a pretty nice addition to the 870 family. I particularly appreciate how Remington has already considered various options and worked to provide a wide range of shooters the shotgun they prefer. Personally, I believe the Magpul version of the 870 DM would be the ideal companion for patrol officers or tactical teams. The Magpul Remington stock is excellent and comes pre-made with sling attachment points (a very big deal for police). The Magpul Remington forend is much better than the traditional Remington forend. Slightly wider and longer, the Magpul forend is ready-built for M-LOK rail attachments allowing officers or agencies to outfit their shotguns with weapon-mounted lights or even optional optics. The Remington 870 DM Tactical is also nice, but the pistol grip is really large and can be cumbersome in tight spaces. Overall we see a lot of good in the Remington 870 DM and look forward to shooting one in the future.